SANTA BARBARA — UC Santa Barbara Nobel Laureate Shuji Nakamura was selected to receive one of Japan’s highest honors, the 2014 Order of Culture Award. The medal, which recognizes contributions to the nation’s culture, was presented by Emperor Akihito in a ceremony at the Imperial Palace in Tokyo on Nov. 3, which is also Day of Culture in Japan. Nakamura, UCSB professor of materials, was among several award candidates selected by Japan’s Ministry of Education, Culture, Sports, Science and Technology from a list of people designated as Persons of Cultural Merit. The recipients of the Order of Culture are decided by the Cabinet of Japan. “It brings me great pride to congratulate Professor Nakamura on this prestigious honor bestowed by the emperor of Japan,” said UCSB Chancellor Henry Yang. “The Order of Culture award is a significant acknowledgement that Professor Nakamura’s invention of the first bright blue light-emitting diode will continue to be recognized the world over for its long-lasting and far-reaching impacts on our global society. Nakamura is widely recognized as the world pioneer in light emitters based on the wide-bandgap semiconductor gallium nitride (GaN) and its alloys with aluminum and indium. The Order of Culture comes in the wake of Nakamura’s win of the 2014 Nobel Prize for Physics, an honor he received in recognition of his invention of the blue light-emitting diode (LED). The blue LED, in turn, paved the way for the white LED, a breakthrough in energy-efficient lighting that has the potential to improve the quality of life for the people of the world who have little or no access to electricity. 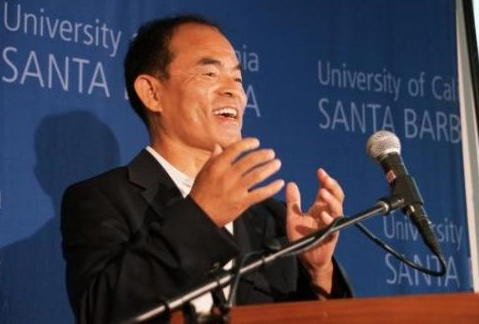 “As one of Shuji’s closest colleagues and friends, I am very proud that Professor Nakamura is receiving the most prestigious Order of Culture medal from his homeland in recognition for his work in changing the world with energy efficient lighting,” said Steven DenBaars, co-director of UCSB’s Solid State Lighting and Energy Electronics Center (SSLEEC). Other friends and colleagues at UCSB expressed their pride and joined in the celebration of Nakamura’s selection for the important Japanese award. Nakamura received his bachelor’s, master’s and doctoral degrees in electrical engineering from the University of Tokushima,. He spent the early years of his career in research at Japan’s Nichia Chemical Industries Ltd., and then spent a year at the University of Florida as a visiting research associate. In 1989, he initiated the research of blue LEDs using group-III nitride materials. In 1993 and 1995, he developed the first group-III nitride-based blue/green LEDs. He also developed the first group-III nitride-based violet laser diodes (LDs) in 1995. Nakamura is currently co-director at SSLEEC, where he continues to develop GaN thin-film technology. He joined the faculty at UCSB in 2000 as professor of materials and of electrical and computer engineering. He was appointed to the Cree Chair in Solid State Lighting and Display in 2001. Six years later, he and his team of researchers at what was then known as the Solid State Lighting and Energy Center at UCSB achieved lasing operation in nonpolar GaN semiconductors. Their demonstration of the world’s first nonpolar blue-violet laser diodes represented a breakthrough in laser diode development.